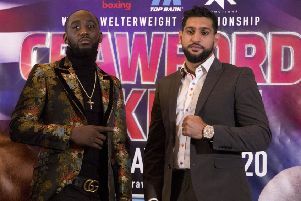 The recent boxing show at Windsor Park might have been a memorable one for Belfast fighter, Carl Frampton, but it also bore witness to a heartwarming act of kindness from heavyweight contender, Deontay Wilder. American, Wilder, and his entourage were in Belfast to watch heavyweight, Tyson Fury, beat Italian, Francesco Pianeta. Fury's win paves the way for the self-titled 'Gypsy King' to face-off against fellow heavyweight Wilder in Las Vegas in November. Little Rory Gallagher is one of Carl Frampton's biggest fans. Rory has cerebral palsy and requires specialist surgery valued at €120,000 if he is to walk. Deontay Wilder and inset, Rory Gallagher. Rory's family have so far raised €64,725 via a GoFundMe.com page. Frampton has visited Rory and his family in their home in Sligo and on Saturday evening the six year-old was ringside to cheer on 'the Jackal' as he defeated Australian fighter, Luke Jackson. After Frampton's victory a short video clip of Deontay Wilder chatting to little Rory was shared on social media by the official Rory's Wish To Walk Twitter account. "My heart might burst," read the Tweet. "My wee Rory's going to Vegas!!! Tyson Fury (left) with Deontay Wilder in Windsor Park, Belfast at the weekend. "The absolutely amazing @BronzeBomber [Deontay Wilder] has invited him over to watch him do his thing against Rory's buddy @Tyson_Fury." Boxing fans from all over the world praised Wilder for his generosity and kindness. "He [Wilder] came over here and showed himself to be a true gent," said one boxing fan. "Boxing is a sport where showmanship is part of it, away from the ring boxers are just people with the same problems we all have," added the fan. A date has yet to be confirmed but it's possible that Fury v Wilder will take place in the MGM Grand in Las Vegas in November 2018.